It's a double header in Elvery's MacHale Park this Saturday night Oct 20th. 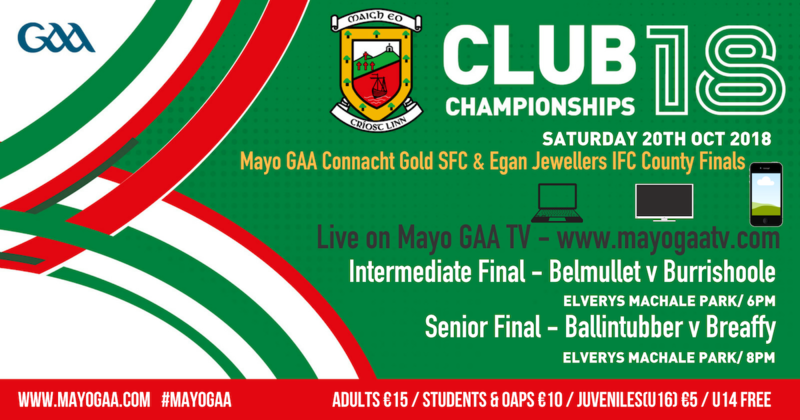 In the Mayo GAA Egan Jewellers Intermediate final, it's Belmullet v Burrishoole at 6pm. While in the Mayo GAA Connacht Gold Senior final it's a West Mayo derby between Ballintubber & Breaffy. The Senior final throws in at 8pm. Tickets cost €15 for Adults, €10 Student & OAP, Juveniles €5 with U14 going free. Adult tickets can be purchased in local Centra or Supervalu shops. Tickets can also be purchased outside the ground also. If you can't make it to Elvery MacHale Park on Saturday night then you can watch it all live with Mayo GAA TV - http://www.mayogaatv.com/countyfinals2018/.